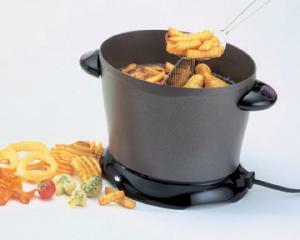 The perfect fryer for making up to eight big servings of food fast and easy. A handy divider allows two different foods to fry at the same time without intermingling. Remove the divider and the fryer's unique oval shape enables fish or larger pieces of chicken to fry easily. The ideal frying temperature is maintained automatically. This deep fryer is constructed of heavy cast aluminum with a nonstick surface, inside and out, for quick and easy cleaning. A snap-on lid allows oil to be stored in the fryer to use again. Slotted scoop included. Big capacity fries up to eight cups of food.